A luxury self catering holiday cottage situated on the spectacular Applecross Peninsula in the NorthWest of Scotland. Holly's House has been recently built to a demanding specification and is now available to the discerning traveller for short holiday bookings. 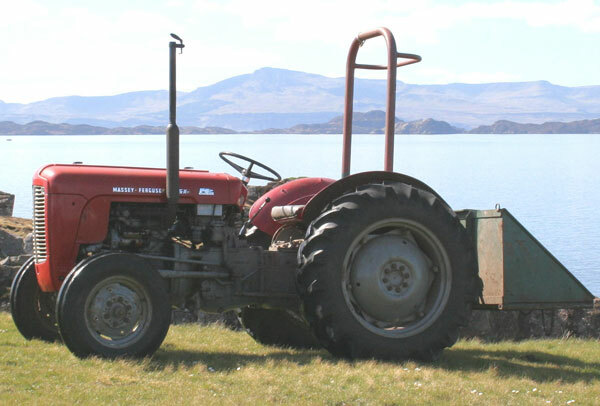 The cottage is on a working croft and is named after the 1954 Massey Ferguson tractor "Holly" that is still in use on the croft and was once housed in a barn that stood on the site of Holly's cottage. Holly's house provides the perfect secluded and intimate setting for couples visiting Applecross, perhaps honeymooning or celebrating a special anniversary, or just passing through this beautiful part of Scotland. If you are thinking of getting married please call to find out how Applecross can cater for all your wedding needs including picturesque locations for the ceremony and fantastic catering options at either the Walled Garden restaurant or the Applecross Inn. The cottage is situated above the beach in the hamlet of Lonbain and enjoys uninterrupted views across the Inner Sound to the islands of Raasay, Rona and Skye. On a clear day the Old Man of Storr can be seen on Skye and you may be able to make out the island of Lewis in the distance. The peaceful location of Lonbain is ideal for relaxing and taking in the views or perhaps watching the local wildlife on land and sea.